It's not inaccurate to say that Hawaii's Haiku Stairs, also known as the "Stairway to Heaven," are one of the most ubiquitous tourist attractions in the entire United States, and a popular destination for hikers in Hawaii. Some media outlets even reported that President Obama had hiked the Haiku Stairs during his 2015 holiday trip to his home state, although it turns out he and the first lady were elsewhere as they stroked the stratosphere. Presidential visit or not, the Haiku Stairs are a popular stop for tourists—the Instagram page documenting the location of the 3,922 steps seems to load into infinity. There's just one problem: Hiking the stairs is illegal, although not for the reason you might imagine. More on that in just a minute, though. Indeed, there's actually a second problem now, albeit one that might be more short-lived: Someone has installed a rickety swing along the periphery of the staircase, which makes a trip up the Haiku Stairs even more terrifying—and yes, even more illegal. Why Are the Haiku Stairs Illegal? The naval base for which the Haiku Stairs were originally built closed in the 1950s, and the navigation station which replaced it closed in 1987, which leads many to believe the Haiku Stairs are illegal due to lack of maintenance or generally poor safety. This isn't a completely far-fetched assumption, given that a popular entertainer died of a heart attack on his Haiku Stairs hike in 2012, but it's not accurate. Indeed, local authorities completely repaired the stairs just 13 years ago, in 2003, at a staggering cost of nearly a million dollars. It is not safety, but legal disputes over land-usage rights, that have kept the stairs officially closed, although most tourists who visit the stairs seem apathetic to the legality of their visit to the stairs, as banal as the underlying reason may be. What&apos;s the Deal With the Swing? 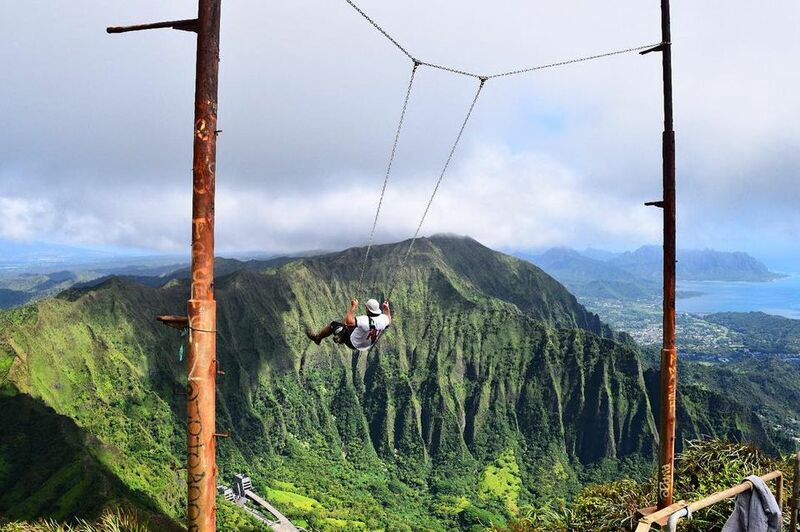 In early June 2016, media outlets like The Huffington Post reported that a swing had been installed near the summit of the Haiku Stairs, a claim the aforementioned Instagram page corroborated in terrifying detail. In fact, many of the most recent photos and videos taken at the stairs are of (crazy) visitors enjoying their turn on the swing. No one knows who installed the swing (he or she probably wants to remain anonymous, due to the legal dubiousness of even being on the stairs), but at the time of this article's publication, local authorities expressed their intent to disassemble the swing as soon as possible. So, if you happen to be hiking the Haiku Stairs and want to make your adventure even more hair-raising, your chance may have already passed. It should be noted again, even though it's mentioned several times throughout this article, that accessing the Haiku Stairs in any way is illegal. I am not encouraging you to visit them, nor do I have the authority to waive the illegality of doing so. What follows is simply me telling you how you would visit the Haiku Stairs, were it legal to do so. Additionally, you should note once again that beyond the legal issues associated with hiking the Haiku Stairs, doing so can be hazardous to your health if you are not in very good physical condition. Now, that we have that out of the way, the Haiku Stairs are about a half-hour's drive from most destinations in central Honolulu. The most straightforward way to reach the Haiku Stairs is to drive north on State Highway 61 to Maunawili, then take State Highway 83 to Kahuipa Street, which dead-ends into the Haiku Stairs parking lot.